As the Care Workers invested into her life, Kamali has learned how to trust and interact with others. The deeper the Care Workers have invested into her life, the more that they have been able to find out about her story. At just four years of age, Gideon became an orphan, losing both his mother and father after they had suffered from long illnesses. Gideon has become the man of the house. He bears the weight of responsibility to find work and give his family a daily chance of having food on the table. Abandoned by his father, four-year-old Tawanda was left to stay in a small shack in Sakubva with his mother, Shorai, and his two brothers. In February 2013, Tawanda’s father returned to the household and, in a terrifying act, set fire to it. What little food, clothing and blankets the family owned were completely destroyed. The family was left with nothing, save the clothes they were wearing. A neighbour in their community allowed the desperate family to stay in her small, oneroomed home until they found another place to stay. There was already a family living here, but it was all Tawanda, his mother and brothers had. They currently all sleep on the same bed. Tawanda and his family face huge challenges. They cannot afford food, clothes or school fees. In order for them to just survive, Shorai has to cut down and sell firewood – back-breaking work for just a few dollars. Tawanda and his brothers were found by the Care Workers from Sakubva Christian Caring Trust in 2012. The Care Workers heard their story and wanted to respond in love. They brought the children to the Care Point in the hope that they could bring some life and light into their lives. The children are now attending the Sakubva Care Point each day for a nutritious meal and to connect with the Care Workers and play with other children. The Care Point in Sakubva is a hub of activity at the moment: a Care Centre is under construction, enabling the Care Workers to provide holistic care to their vulnerable children. It is a noisy, welcoming and a nurturing environment for children like Tawanda to attend. Angeline, one of Sakubva’s Care Workers has been running education classes for Tawanda, his older brother and other children who do not currently attend school. She does this in preparation for the children to eventually attend formal school. At present, Tawanda is learning how to count to 20 and to write his name. 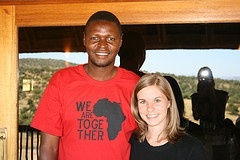 Christine, another Care Worker visits Tawanda and his family twice each week. She assists them with any work that needs to be done in their house but also listens and prays with them. Christine has brought hope to the whole family by her very presence. When Sakubva Community Based Organisation recently received a donation of clothes and blankets, Tawanda and his brothers received clothing and a blanket each. It has been a huge blessing to the family. After receiving these items, Shorai told the Care Workers that she has seen God working so clearly in her life –in His provision for her and her children, and through the love and care of the Sakubva Care Workers. 41-year-old John is a volunteer care worker in Pimai, Zimbabwe committed to transforming the hopeless situations of vulnerable children in his community. Pimai is a poor rural village surrounded by tea and coffee farms approximately 130 km from Mutare, Zimbabwe. Many of Pimai’s population are families who fled Mutare after falling ill from HIV/AIDS and becoming too sick to work. Desperately seeking a place to feed and house their families, they moved out to the rural village. With the inevitably high death rate among many of those patients, scores of children have been orphaned and left in extreme vulnerability. We successfully ran a training workshop for the care workers in Sakubva, which has subsequently resulted in improved relationship building between the care workers, OVCs and patients/primary guardians. 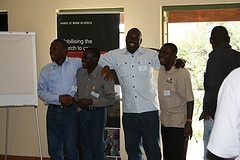 The training was also successfully closed with a ceremony that saw the caregivers being awarded with medical aid kits. We managed to invite local authorities, including the Councillor for the Sakubva ward, the Deputy Director of the Mutare City Health Department, one of our trustees, Dr. Geoff Foster, and our country representative, Emily Dinhira, all of whom were present and spoke at the ceremony.